You must know by now that article marketing is THE way to establish yourself on the Net. And the new hype is tip articles. Now, most tools are very expensive and very complicated or on the other hand little functionality againt a low price. 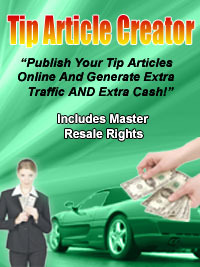 Comes in Tip Article Creator. This incredibly simple to use piece of software allows you to convert any text article or data into a search engine friendly web page in seconds and much more.